Oh, Atom. Poor Atom. Here I hold in my hands - just barely, given the size - another masterpiece from the toysmiths at threeA. I'm holding a figure with astonishing levels of detail, to the point where his feet have springs on them smaller than I thought you could make springs. With a paintjob that looks real. With levels of movement that other toy companies can only dream of implementing. And yet, I'm also looking at an ugly figure. An ugly figure based on Real Steel, a movie nobody really cared about, and which came out in 2011. Which in 2013 is a problem for poor Atom. If you look at him from a distance, there's so much going on under his plates you'd be forgiven for thinking it's a real robot. If you get up close, he still looks like a real robot. Every tiny hydraulic shifts, every little spring snaps and every little pivot turns. 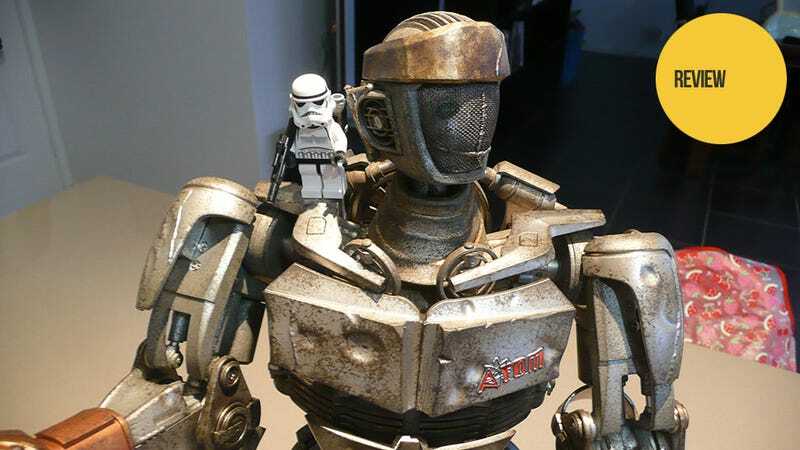 It really does look like threeA have put a shrink ray on a real, live fighting robot. Perhaps the one thing that sets threeA apart from any other toy company is their approach to paint. There's nothing glossy here. Atom looks filthy, with a rough, matte finish that helps add to the feeling he's been shrunk. The range of movement he's capable of is insane. It's one thing to allow for enough posing to get him ready for the shelf, but to include things like a rotating torso - something you'll never actually do - does nothing but show how much thought and effort goes into threeA's larger pieces. All that detail comes at a cost. While his head and arms feel like solid steel, other areas like his feet and legs are much more flimsy. Um, who exactly is going to buy this? Real Steel came out in 2011, and most robot designs - Ambush excepted - sucked. It seems a waste to have gone to all this effort for a property I just can't see anyone caring about enough to pay over $300 for. He may be a lame duck character, and an ugly one to boot, but as a work of toy building Atom is one of threeA's best. They really come into their own when they're working on this kind of scale and in this kind of detail. It's just a shame, then, that all that good work had to be spent on someone else's design. That looks like...this. Atom will be available from Sideshow and threeA later this month.